This book is so much more than the synopsis makes it seem! 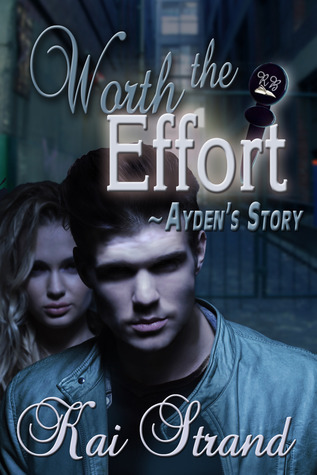 I love this second novella in the Worth the Effort series! Reading from Ayden’s point of view was so cool! Especially since it continues the story further and we get to see more of what he’s been up too. Ayden himself has got to be one of my all-time favorite characters. He’s so…real. He has issues and insecurities and deals with them in such a real way that makes you think that he could just walk off the pages of the book (I wish! He sounds so handsome!). I really love how this story tackles harder issues of life, even in a numbered of pages. The reader goes through so many emotions with Ayden that you can’t help but feel for him the entire time. Also, having Ella along with him is also awesome since I loved her character in Worth the Effort: Ella’s Story. I guess what I’m trying to say overall is I literally cannot say enough good things about this series, its characters, and Kai Strand’s writing styles and plots. I look forward to seeing a lot more good things from her!